The Morrison Hotel on Dublin’s Ormond Quay now boasts a completely refurbished Quay 14 bar and Morrison Grill restaurant, following a design overhaul costing over a quarter of a million euro. The always stylish hotel, which re-opened six years ago, is now lighter, brighter and more connected to the beat of its city centre location, with large opening bi-fold windows allowing the outside in, pouring light into the rooms, making the most of the views out over the Liffey. The Morrison is now the perfect place to linger, whether for a meeting, dining or drinking. 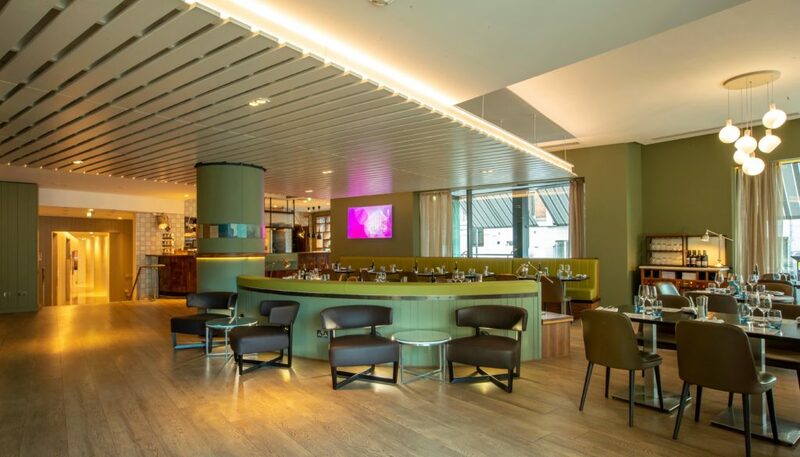 Cleverly, the interior designer team, made up of Elizabeth Kirby and David Loughnane of Invent Interiors, have created more seating across the restaurant and bar spaces, while also improving the flow and sense of a classic urban, contemporary space. Bespoke Italian furniture from bar stools, to lounge and dining chairs are tactile in a mix of leather, stitched seams and textured fabrics. The colour palette is muted in earth tones, with pops of colour from bright yellow bar banquette seating. A mosaic wall of high shine and frosted mirror panels, draws in the city light and casts it around the bar highlighting the touches of Italian marble and stainless steel throughout. The new autumn winter menu, the famous Fancy Pants or Gentlemen’s Afternoon Teas (now available in wheat free and vegetarian versions), super-fast and free 900 Mb wifi, and complimentary sweet treats served with the Morrison’s bespoke coffee, provide a host of reasons to revisit this chic city hotel. The Morrison Grill is more popular than ever, with Chef Sushil Kumar creating regular specials to complement the menu. Some of the most popular dishes include the prawn pil pil (€11) with galangal, garlic, chorizo & chilli, served with dipping bread and the sea bass gabonese (€27) with parsley and butter spuds, courgette and fine beans with citric salsa. From the Bar Classics menu, the aged beef & Guinness stew (€17) with roasted roots, mashed potato and puff pastry is a real crowd pleaser. Steak Night, every Thursday, is enormously popular. Choose from a Wagyu beef burger (€23), the Morrison burger (€17), the salt moss aged striploin steak (€29) or the t-bone steak (€33), and enjoy a complimentary glass of house red, white, prosecco or a pint of Heineken.